Los Angeles—The Iron Age revolutionized Africa and forever altered human civilization practically and symbolically. 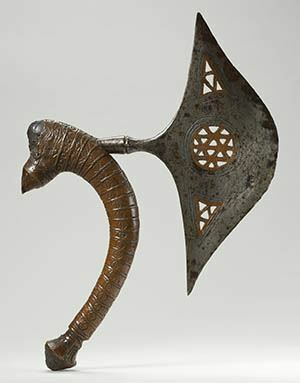 Striking Iron: The Art of African Blacksmiths, organized by the Fowler Museum at UCLA and on view June 2–December 30, 2018, reveals the histories of invention and technical sophistication that led African blacksmiths to transform one of Earth’s most fundamental natural resources into objects of life-changing utility, empowerment, prestige, artistry and spiritual potency. The exhibition, which will travel internationally after its debut at UCLA, features more than 225 works of art, including blades and currencies in myriad shapes and sizes, wood sculptures studded with iron, musical instruments and elaborate body adornments. Technologies of iron smelting and forging, which likely began on the African continent around 2,500 years ago, were ardently sought and protectively guarded. Their control could promote a king’s ambition, enhance a soldier’s fortune, and secure a community’s well-being. Iron tools and weapons enabled Africans to forage, hunt, and till the soil, assuring prosperity and protection. Nowhere else in the world are there more diverse and accomplished forged iron forms than in Africa, and Striking Iron is the most comprehensive exhibition of this material to date. Most of us take for granted the fact that iron keeps us alive and that there would be no Earth as we know it. Iron is in our blood, making it red. It is in the earth’s core and rocky crust. Popular culture embraces the strength and power of iron with such phrases as “iron will,” “iron grip,” and even “heavy metal.” The superhuman attributes endowed by iron are the stuff of Marvel’s Iron Man, while the centrality of Vibranium to Black Panther’s technologically advanced Wakanda is surely a metaphor for the centrality of iron in many African cultures.